Samsung has announced two smartphones in its refreshed Galaxy A-series in India. 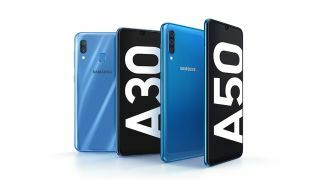 On Monday, the South Korean electronics manufacturer made the Galaxy A30 and Galaxy A50 official but we still do not have any information whatsoever regarding the price of either. As we reported earlier, the microsite for Samsung Galaxy A-series went live, revealing a couple of key features and now we know everything there is to know about the A-series smartphones. According to previous leaks, it was expected that Samsung will introduce three smartphones in the A-series but it seems like the Galaxy A10 is being left out from the initial debut of the lineup. Both the Galaxy A50 and Galaxy A30 feature a 6.4-inch Full HD+ (2340 x 1080 pixels) Super AMOLED display topped with the infinity-U notch design. These are the first two phones from the company that features a u-shaped notch which is similar to the usual waterdrop notch, albeit smaller. The phones are built from plastic and have a glass-like glossy coating. The phones are 7.7mm thin. The A30 is powered by Samsung Exynos 7904 chipset with an octa-core CPU. It will be available with either 3GB RAM and 32 GB storage or 4GB of RAM and 64GB storage. On the other hand, Galaxy A50 has a more powerful Exynos 9610 chipset and is being offered with 4GB/6GB RAM and 64GB/128GB storage onboard. Users can expand the memory by up to 512GB via microSD card on both the phones. There’s a fingerprint sensor on the back of the Galaxy A30 while the A50 features an in-display fingerprint sensor. This makes the Galaxy A50 only the second phone by Samsung to come with a fingerprint sensor underneath the screen. Camera setup on the Galaxy A50 consists of three rear cameras, a primary 25MP sensor with an f/1.7 aperture, secondary 5MP depth sensor and an 8MP ultra-wide lens. On the front, there’s a 25MP camera for selfies as well. While the A50 has a triple camera setup, the A30 has two cameras. One of them is a 16MP primary and the other one is a 5MP ultra-wide sensor. The A30 has a 16MP selfie camera on the front, housed in the notch. Both the Galaxy A50 and Galaxy A30 come with 4,000mAh battery and support fast charging.